Who is threatened by the weak yuan? A significant devaluation of the Chinese currency, the yuan, has brought an avalanche of explanations about why China needs this and why it is happening now. Each of these arguments has merit and, to a greater or lesser degree, has led to such a sharp, “landmark” fall in the value of China’s currency. China is now the world’s second largest economy, after the USA, in GDP terms. A similar event occurred in Russia mid-2014; the Bank of Russia moved to a floating exchange rate. The Chinese stock market collapse over the past few weeks saw the yuan being devalued several times over a few days, to shore up exports and stabilize the economy. Whatever the reasons behinds this sharp “correction” of the value of the local currency, this step is a logical completion of the evolution of the Chinese economy after the crisis of 2007-2008. Many who said in 2010-2011 that the crisis had ended and the world had returned to the growth trajectory proved too optimistic. The world’s GDP growth rate of 4 to 5 percent over that period has now fallen below 3 percent, with prospects for recovery to higher growth rates not looking too great. In this sense, the “slowing down” of China is a reflection of the global trend of an economic slowdown, which is now clearly manifested in falling commodity prices and a sharp decline in world trade. Given that the “business model” of China is export-oriented and the resource of cheap labor is almost exhausted, the country’s leadership must take a very tough decision on either a change of model, or the search for a new growth stimulus. In this context, the exchange rate was virtually the only candidate, especially for a quick, albeit temporary solution. On the other hand, the need for devaluation of the yuan has been brewing for a long time. 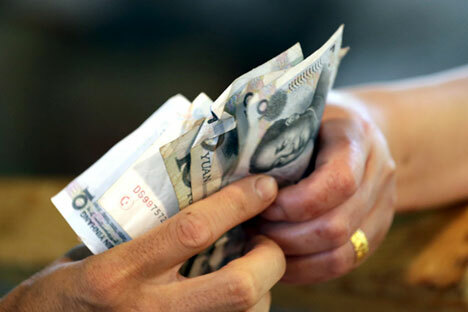 Compared with its rivals – major exporting countries – China’s currency has strengthened by 30-50 percent compared to the last pre-crisis year of 2007. After the crisis of 2007-2008, the currencies of Russia and China at first took a “parallel course.” In 2013, the ruble started gradually weakening in Russia, which resulted in the transition to a “floating rate” in 2014, under the conditions of falling oil prices and the rising dollar. Being pegged to the dollar, the yuan has persisted, but it has not brought benefits to the Chinese economy; exports have continued to decline, necessitating this difficult decision. The difference between Russia and China is that Russian exports are mainly raw materials, while Chinese exports have a very wide range; from consumer goods to complex industrial products. As a result, the prospects for recovery and growth of Chinese exports are directly dependent on the speed and size of the devaluation of the yuan, while Russia remains largely hostage to the dynamics of oil prices. Until mid-2011, China, like its main rivals; Europe, Japan and Korea; maintained a status quo. But the “quantitative easing” programmes or, to put it simply, the massive printing of money, have started to be broadly applied in Japan and in Europe. The sharp appreciation of the dollar during the second half of 2014 and the first half of 2015 actually forced the situation to a logical ending; China began to devalue the yuan. The process will be not limited to 3 or 5 percent; for a more or less acceptable “alignment” of the situation, this figure should reach 20 to 30 percent. Perhaps, it will be accompanied by a transition to a more liberal exchange rate regime in China, to the “floating-yuan” policy in one form or another. For Russia, in turn, political agreements remain a much more important factor than exchange rates, including those on the active use of national currencies in this process. So, the increased volatility of the ruble and the yuan may be more than offset by the support mechanisms, such as public funds and banks, through the mechanism of guarantees, trade financing, insurance, and so on. All of these tools, if used properly, can help Russian and Chinese businessmen weather the storm, which has taken hold in the sea of currencies. And, paradoxical as it may seem, the most stable “reef” in this sea; the U.S. dollar; may become the main victim of the disaster. Konstantin Korischenko is head of the stock market and financial engineering department at the Finance and Banking Faculty of the Russian Presidential Academy of National Economy and Public Administration, and a former deputy chairman of the Russian Central Bank.